Video Produced by Josh Cassidy. For salmon lovers in California, October is “the peak of the return” when hundreds of thousands of Chinook salmon leave the open ocean and swim back to their ancestral streams to spawn and die. All along the Pacific coast, starting in the early summer and stretching as late as December, salmon wait offshore for the right time to complete their journey inland. In Alaska, the season starts in late June, when salmon head to streams in lush coastal forests. Although this annual migration is welcomed by fishermen who catch the salmon offshore, scientists are finding a much broader and holistic function of the spawning salmon: feeding the forest. Millions of salmon make this migratory journey--called running--every year, and their silvery bodies all but obscure the rivers they pass through. This throng of salmon flesh coming into Alaska’s forests is a mass movement of nutrients from the salt waters of the ocean to the forest floor. Decomposing salmon on the sides of streams not only fertilize the soil beneath them, they also provide the base of a complex food web that depends upon them. Incoming salmon keep forest soils fertile. Due to gravity and erosion, forests continuously lose soil and nutrients to the water. Migrating salmon reverse this process by eating fish and krill at sea and bringing nutrient-rich body mass back into the forest. When bears pull hundreds of thousands salmon onto the shores of coastal rivers every year, the decomposing fish, rich in nitrogen that help trees and shrubs grow, enhance the soil. Their mass migration into the forest is like a pipeline of nutrients from the sea. Tom Reimchen, a forest ecologist at the University of Victoria in British Columbia, said nutrients derived from the open ocean can be observed in old-growth trees, hundreds of years old, as well as the animals that live on them. Reimchen and his research group track how nitrogen from the ocean spreads through the forest. They use isotope analysis to identify a heavy version of nitrogen atoms, called N15, that is relatively abundant in marine algae but very rare on land. When he finds N15 in the forest, Reimchen knows it likely traveled thousands of miles in the body of a salmon to get there. Around salmon-rich rivers, 40 to 80 percent of the nitrogen in shrubs and trees originates in the open ocean, he said. And the salmon signature isotope can be found as far inland as the Rocky Mountains. There’s a cascading effect on the food web. Salmon are primarily eaten by bears, who pull them out of streams and eat, on average, about half of each fish. The rest is consumed by gulls, ravens, crows, eagles--and insects. 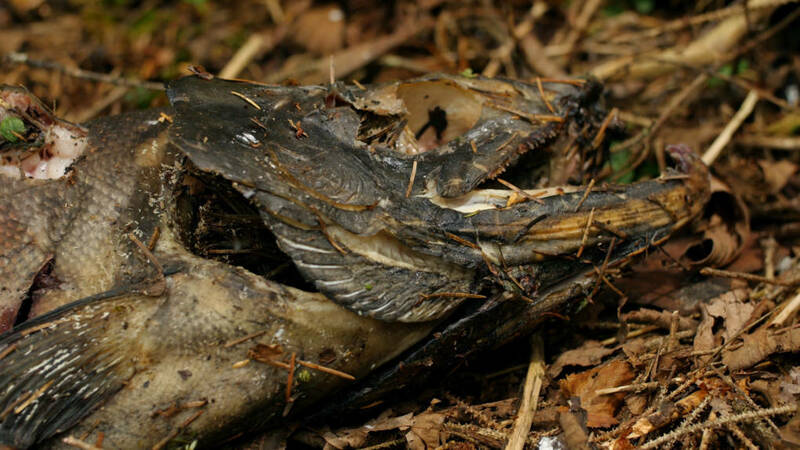 A decomposing salmon can provide food for up to 55 insect species. One of the most significant is the blowfly, whose maggot offspring will pick a fish carcass to the bone in a few days. After maturing, these blowflies travel throughout the forest, providing food for spiders and birds, and even pollinating forest flowers. Black bears and grizzly bears will migrate from great distances for their yearly salmon feast. On average, a bear can pull up 500 to 700 salmon in a single season. But lots of other animals eat the fish and the flies. Without the salmon, he said, you won’t see nearly as many. In Alaska, salmon populations are high compared to the rest of the Pacific coast. Salmon are the lifeblood of Alaska, a foundational species in forest ecosystems and a leading industry. “In the coastal regions of Alaska, all the way up to the Artic, salmon still form a backbone of the economy,” said Rich Mattson, who works at the DIPAC salmon hatchery in Juneau. In Southeastern Alaska, where this Deep Look video footage was taken, fisheries employ a fifth of the population and bring in half a billion dollars every year. In this small region, salmon accounts for 72 percent of fishing revenue. To support the industry, salmon hatcheries raise baby salmon and release them into the wild to boost natural populations. About 20 to 30 percent of Alaskan salmon catches come from hatcheries. But in other areas, salmon populations have plummeted. In California, some have decreased by 98 percent, and in Oregon and Washington, historic populations have been cut in half due to human development, pollution and damming of rivers. One of the biggest threats to current salmon populations in California is a lack of water flowing through rivers and streams in springtime, which is often caused by diversions for farms and cities, and drought, according to John McManus, director of the Golden Gate Salmon Association in Petaluma. The straightening and channeling of rivers also threatens the survival of young salmon on the way from spawning grounds to the ocean in the spring, he said. This valuable food source is gone now that humans have “tamed the rivers”, as McManus puts it. It’s unclear what the exact impact of these population losses are to Pacific ecosystems, but according to Reimchen, a lack of salmon has a major impact on coastal forests. In his research, Reimchen found that trees will grow half as fast in forests patches with no salmon, compared to salmon-rich patches. This dramatic decrease in populations also threatens the complex web of life, which depends on an annual influx of salmon from the ocean. “There’s a tight coupling--absolutely unambiguously, between historic reduction in numbers of salmon and the species that depend on them,” said Reimchen, referring to bears, eagles, gulls and songbirds, among countless others. In California, the end of the historic 2011-2016 drought is good news for salmon and the ecosystems that depend on them.